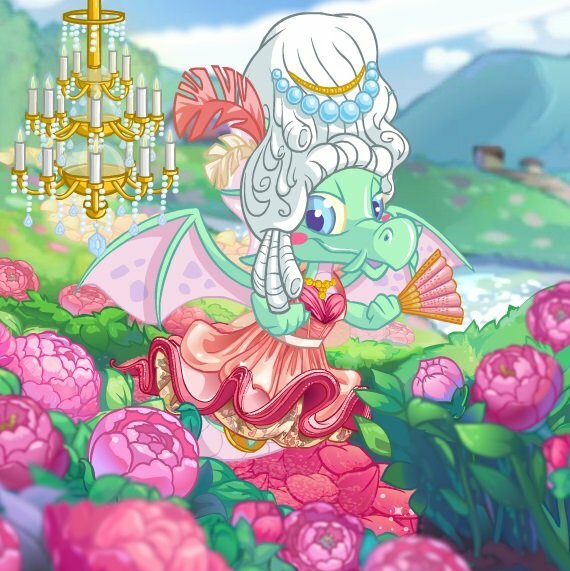 Deep in the heart of Meridell, people were getting sick of all the glory Faerieland was getting with their Poogle Racing. Now, Meridell has its own races with Turdles (as they're so much cooler). Care to bet? Turdle Racing is a very similar layout to the familiar Poogle Racing in Faerieland. Apart from a few little tweaks, any Poogle Racing fanatic could fit in nicely playing Turdle Racing. The information above the Scorchio is the important bit of the page. You get to make 3 bets on a Turdle each day. The data shown is what the time is, how long until the next day starts and how many bets you have remaining. If the time remaining is less than an hour, I suggest taking your remaining bets. You're not going to go there again in the next hour, are you? 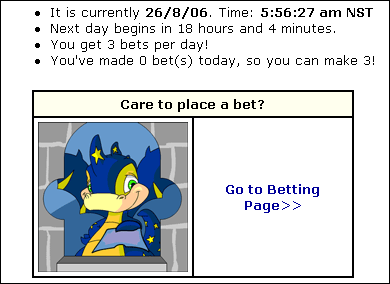 Everyday, at 12 midnight NST, your 3 bets are reset and do not carry over to the next day. Sorry. Turdle One is called "Stinky", although he apparently doesn't stink when it comes to races. He has a habit of getting last minute victories. This Turdle is called "Poopy". He is known for his cunning and devious ways to make sure he gets to the outside ring before the rest. Turdle Three is known as "Smelly". He uses the fact that he never washes to deter any potential winners from beating him. Smart thinker, or just lazy? Up to you, I guess. This Turdle is called Squelchy, due to the fact that he often sticks to the floor of the arena. Is that what you want from something that could win you thousands? "Nutty", this Turdles name, expels random bursts of energy. However, this can go fast and so is prone to randomly falling asleep. Personally, I find that the odds don't matter. So go with Turdle Five for every bet. But, you don't have to follow my advice. Go with whichever Turdle you think is a potential winner for the upcoming race. Pick-a-Turdle - Exactly what it says on the tin. From the drop down box to the right of it, you pick the Turdle you want to bet on. It has the number and the name, so it's simple. Feed a Turdle? - If you have any food item in your inventory, you can offer it to the Turdle you are betting on. I think it makes no difference, but you could do it as a good luck thing to do. 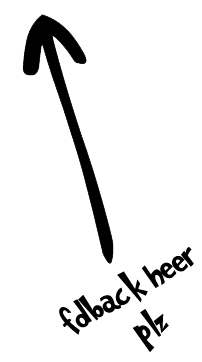 But a trick to feed it but still keep it is to put it in the trades before going onto the page. That way, you can save it and feed it to your pets! Horray! Once you hit the "Place your bet!" button, you will be jumped staight into the action. The Turdles start in the middle and the first to make it out of the circle wins. If your Turdle stops (as mine did) it usually means that you have lost, unfortunately. When all but one Turdle have stopped, it's obvious which Turdle won, but they feel the need to tell you at the end. Unluckily for me, Turdle Five didn't win. He didn't even get close! If you did win, you will be told on the translucent window that pops up at the end of the race. Prizes are awarded depending on what Turdle you bet on. 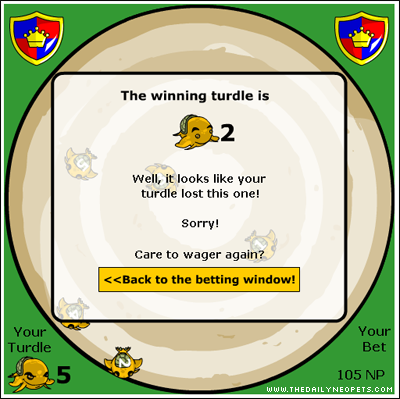 If the odds are 3:1 on your Turdle, and you win, you will get 3 times your bet as a prize, plus your original bet. 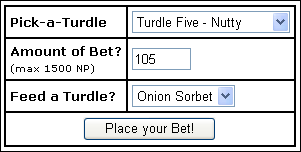 Say I had won my bet of 105NP on Turdle Five, I would have won 945NP plus my original 105NP. Nice little earner, eh? Turdle Racing isn't something you can practice, only perfect and hope on luck. Playing over and over again will fine tune your betting capabilities and know how to bet how much on what Turdle to achieve a net (overall) profit. Good luck, you'll need it! The Snowager is awake. He'll be sleeping in 4 hours, 20 seconds.